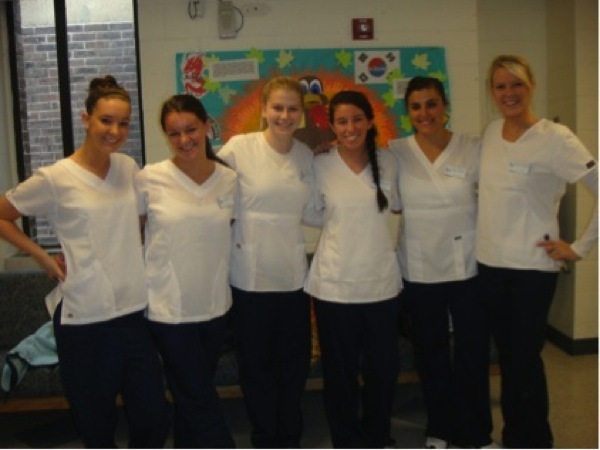 From left, Rose Mayr, Jill Booth, Meredith Herbert, Madison Spillane, Alex Carideo and Kelsey Brinkman--most, but not all, of Rodney E4's nursing students on the first day of lab. Photo courtesy of Meredith Herbert. 6:29 p.m., Aug. 23, 2012--A funeral service will be held Saturday, Aug. 25, in Ellicott City, Md., for Rose Louese Mayr, a junior nursing major at the University of Delaware who died in a train accident Aug. 21. She was 19. “We are very saddened by the sudden and tragic loss of one of our community members," said Dawn Thompson, dean of students and associate vice president for student life. "The University of Delaware community extends its condolences to Ms. Mayr's family and friends." Ingrid Pretzer-Aboff, assistant professor in the School of Nursing, said, "Rose was in my health assessment class. She was an awesome student and had such potential and talent. I loved how her eyes smiled as she was practicing her health assessment skills with the other students in the class. Her bedside mannerisms were exceptional. She was sweet, kind and gentle. She will be missed by all. My thoughts and prayers are with her family and friends. We will miss her contagious smile in the halls of McDowell." Her friend Paige Mazzie, a junior in the College of Education and Human Development, called Ms. Mayr "one of the most amazing people I have ever met" and "a friend that could and will never be forgotten." She said, "Rose was a beautiful, kind and loving friend who was always there for anyone. Rose always went with 'the flow' of everything: always calm. She brought a smile to anyone's face without having to try. Rose was also an amazing dancer and singer. (She even tried to teach one of my roommates to sing out of sympathy, but I'm not sure that worked.) Her dancing and singing would light up the room and amaze people. Rose Mayr was a smart and intelligent woman as well. She was in the nursing program, from what I gathered a very hard program, and she always seemed to come out on top with most of her grades while being able to balance studying and her friends. Rose was her own person and an amazing friend to me and many others. This year will not be with same without her as a roommate and a friend. I loved Rose like many others, and she will forever be in my heart and with my memories." Jill Booth, a friend and a junior in the College of Health Sciences, said, "Rose Mayr was a person you meet once in a lifetime and someone who could change your life in an instant. Her spirit was captivating and her personality unforgettable. Our friendship formed a unique bond that some people may never experience and one I will cherish for the rest of my life. I am honored and will be forever grateful to have shared so many memories with her during our first two years at the University of Delaware. Our sweet Rose will always be in my heart." Ms. Mayr is survived by her parents, Mark J. and Sharon R. Mayr, and sister, Anna L. Mayr, as well as many aunts, uncles and cousins. Her grandparents are Roger and Theresa Mayr and the late J. Darwin and Patricia Ross. Viewings will be held from 3-5 and 7-9 p.m., Friday, Aug. 24, at Harry H. Witzke's Family Funeral Home, 4112 Old Columbia Pike, Ellicott City, Md. A funeral service is scheduled at 11 a.m., Saturday, Aug. 25, at the Bethany United Methodist Church, 2875 Bethany Lane, Ellicott City, Md. In lieu of flowers, memorial contributions may be made to the Howard Hospital Foundation, 10700 Charter Drive, Suite 250, Columbia, MD 21044. Condolences may be left online at Harry H. Witzke's Family Funeral Home website. Students are encouraged to contact the Center for Counseling and Student Development at 302-831-2141 for any needed support and assistance during this time. Also, the staff in the Office of the Dean of Students is available to meet with any student who wishes to talk about this tragic event. Call 302-831-8939 to schedule an appointment or stop by 101 Hullihen Hall.